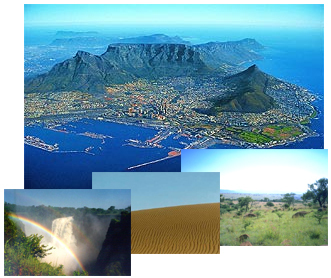 South Africa is a large country with an area five times that of the UK, or that of France, Spain and Portugal combined. To drive from Cape Town to the southern Kruger Park would be a trip of ne arly 2000 km (1250 miles). And the Kruger Park is not your average park; the area is nearly that of Wales. Superimposed on a map of England it will reach from London to Middlesbrough. Time zone: GMT + 2 hours. No daylight saving time. Left hand driving. Condition of the roads is generally good. Most of our clients self drive. Crime: We do receive concerns regarding crime and security in general. South Africa is one of the countries with large differences in wealth and income between various groups. You need to think of what you are doing and where you are going. Do not walk alone or drive after dark. However, it is a fact that a very large portion – some say 90 % – of reported crimes takes place in areas where tourists are advised not to go unguided. Comprehensive information on these and related matters is included in the travel itinerary and advice that our clients receive from us prior to leaving home.